This is the true story of two lifelong best friends - Justin and Patrick - determined to live life to the full. When Justin lost the use of his limbs due to neuromuscular disease, Patrick was there to help, and the pair would undertake the 500-mile Camino pilgrimage. 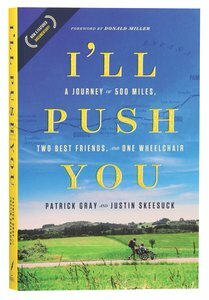 About "I'll Push You: A Journey of 500 Miles, Two Best Friends, and One Wheelchair"
:Two best friends, 500 miles, one wheelchair, and the challenge of a lifetime. Friendship takes on new meaning in this true story of Justin and Patrick, born less than two days apart in the same hospital. Best friends their whole lives, they grew up together, went to school together, and were best man in each other's weddings. When Justin was diagnosed with a neuromuscular disease that robbed him of the use of his arms and legs, Patrick was there, helping to feed and care for him in ways he d never imagined. Determined to live life to the fullest, the friends refused to give into despair or let physical limitations control what was possible for Justin. So when Justin heard about the Camino de Santiago, a 500-mile trek through Spain, he wondered aloud to Patrick whether the two of them could ever do it. Patrick's immediate response was: I'll push you. I'll Push You is the real-life story of this incredible journey. A travel adventure full of love, humor, and spiritual truth, it exemplifies what every friendship is meant to be and shows what it means to never find yourself alone. You'll discover how love and faith can push past all limits and make us the best versions of ourselves. Patrick Gray is the founder and President of the Prevoyance Group Inc., a company that focuses on providing IT strategy consulting, with past clients including Gillette, Pitney Bowes, OfficeMax, and several other Fortune 500 and 1000 companies. His recent work has focused on international projects, and he has led implementations for foreign subsidiaries of several U.S. companies. He has published several articles and has been quoted numerous times in major publications such as the "New York Times," "InfoWorld," "Project Manager Today," "CIO India," "American Way," and "Business 2.0,"
Customer Reviews For "I'll Push You: A Journey of 500 Miles, Two Best Friends, and One Wheelchair"
It is difficult to find words to explain the impact that reading this story of the true journey that Patrick and Justin took across the 500 mile Camino trail. Inspiring, challenging and hope giving. These men authentically share not just their physical journey, which in itself totally amazing, but also their emotional and spiritual journey. So incredibly encouraging!